Leo Da Silva Lopes on his Posh debut in April 2015. Da Silva Lopes made his debut for Posh aged 16 in 2015 and played over 100 times for the club before moving into the Championship with Wigan for close to £1 million last summer. Leo Da Silva Lopes (left) in action for Posh against Chelsea. The 20 year-old has yet to make his mark in the second tier, but a loan to Gillingham in January leads him back to London Road for the first time tomorrow (April 6). “Posh is a good club,” Da Silva Lopes stated. “It’s like a selling club really. I still follow their results to see what they’re doing but that’s about it. It is just another game for me. 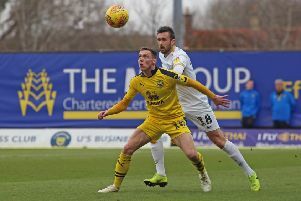 “Most of the players I played with aren’t there anymore and it’s pretty much a brand new team, apart from Marcus Maddison who is too good to still be there. “I got into the first team quite young. I made my debut aged 16. It was a bit nervy in the first game, but I didn’t get nervous after that. I started to break into the team when I was 17 and I stayed there until I was 19. “Dave Robertson gave me my debut and then Graham Westley, Grant McCann and Steve Evans all played me. Before then I was just starting to train with the first team when Darren Ferguson left. “The highlights were playing Chelsea away, winning at Aston Villa and scoring twice in a home game against Bristol Rovers. “I haven’t played many games for Wigan, but it is a big squad. It has been tough, moving up north and living by myself. I wasn’t really in the frame there for the first couple of months. Then there were a few injuries and I got on the bench a bit and then made my debut. After that, I thought I needed some game-time. “There were a few clubs interested early on and that broke down and it came to the last day and it was pretty much just Gillingham. Posh boss Darren Ferguson said: “I always felt Leo would go on to have a good career. That’s the still the case even though he it hasn’t worked for him at Wigan yet.